Hi Everybody! I'd like to thank everyone who has attended our meets and cruises! It doesn't matter you've been with use for the last five years or you've just found out about us last month. We appreciate you all! For our 5-year anniversary we will be doing a Scavenger Hunt/Rally. This scavenger hunt combines the fun roads you have come to enjoy, along with Points of Interest you may or may not know about. It’s open for everyone to enjoy regardless of their skill level or car’s performance. There are many different routes that can be used to complete this. The final scores will be determined by "Points Reached" divded by "Total Time", the highest number wins. The $10 entry free is optional, but only those who provide it will be eligible for a cash prize. The cash prizes come from the entry fees. The remaining 10% will be used to promote the BMW Meet. The Scavenger Hunt leaves at 2:00PM. Full details will be handed out on paper on Saturday. Co-driver and GPS Navigation highly recommended. Camera or camera capable phone required. 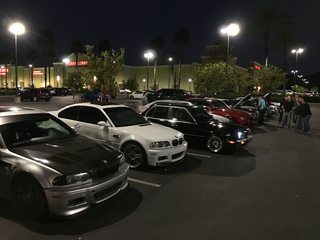 This is a monthly BMW meet for San Diego North County. All BMW Enthusiasts are welcome regardless of what you drive. 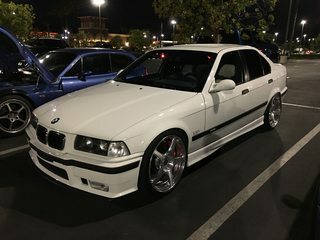 Old, new, modded, stock, and even non-BMW's are welcome as well. This meet takes place from 6PM to 8PM, unless posted, every Last Saturday of the Month at the Creekside Market Place. It is easily located off the 78 on San Marcos Blvd and Grand Avenue. It's the 1st aisle closest to Grand Ave, which can be easy to miss. feel free to share this event to friends and fellow BMW enthusiasts. This meet will occur one week earlier due to the 25th being so close to Thanksgiving. We will be doing meet AND a cruise this month. The meet is scheduled as normal, Saturday, but the cruise will occur the following day, Sunday. Out of interest, our route will be on the longer side this time. Please check the map to make sure you are comfortable with the driving distance. Please arrive with a full gas tank or you will have to stop somewhere for fuel, not fun trying to find gas in the middle of the desert. This cruise will take us through familiar roads in the mountains east of San Diego and will tour part of the desert. Areas included are Ramona, Alpine, Mt laguna, Jacumba, Anza Borrego, and Julian. We will take a break somewhere along the halfway-point or in Julian. 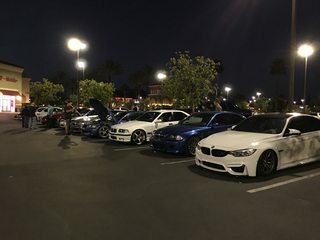 This is a monthly BMW meet for San Diego North County. 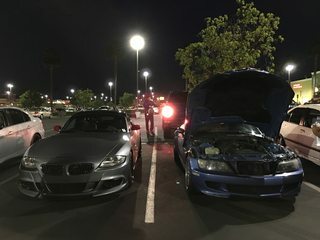 All BMW Enthusiasts are welcome regardless of what you drive. Old, new, modded, stock, and even non-BMW's are welcome as well. This meet takes place from 6PM to 8PM, unless posted, every Last Saturday of the Month at the Creekside Market Place. It is easily located off the 78 on San Marcos Blvd and Grand Avenue. It's the 1st aisle closest to Grand Ave. We do cruises every once in a while. Feel free to share this event to friends and fellow BMW enthusiasts.